Q) What is steel fencing used for? A) Steel fencing is used for building solid and secure perimeters around many residential and business areas. It can also be used to surround parks and sport facilities to allow for a barrier to keep balls and other equipment inside and to protect the sports facilities from vandalism. The agriculture uses vary from providing safeguards for livestock to keeping away pesky predators who might want to snack on your livestock. Q) What are the benefits of steel fencing? A) The benefits of steel fencing over other fencing is the variety in which the steel fencing can be applied (can be used as stainless steel or even galvanised) and then used to fit many different customers’ needs. Another benefit is the resistance to corrosion and rusting. The last benefit is the mass production of this metal means that steel fencing prices are usually lower. Q) What types of steel fencing exist? A) Some types of steel fencing are temporary fencing, galvanised steel fencing, stainless steel fencing, mesh steel fencing, palisade steel fencing and many others that have factors that make them perfect for certain requirements. All steel fencing is tailor made for specific requirements so it’s best to take a good look at the options out there and then go with the best option for your specific purpose. Q) What is the cost of steel fencing? A) Steel fencing costs vary a great deal depending on the type of steel fencing and the style (height and length are also a big factors) of the steel fencing itself. The rough cost for instance of a 6 foot fence for a garden or residential property could be from £50 - £100 and for a chicken type of mesh fencing it can be £150 - £250 for a 15m length of fencing. No real figures can be accurate enough and it all varies depending on certain factors. Q) Who are the manufactures of steel fencing in the UK? 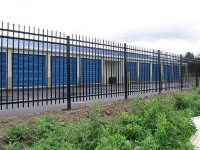 A) There are many manufacturers of steel fencing in the UK but some of the companies are Paramount steel fence, Metropolitan, total security solutions, Peart fencing, Steel fencing UK LTD, and Procter fencing systems. There are also many other companies (probably best to look for a local company to reduce costs and if things don’t go as planned their site is close to offer help). Q) Can I install steel fencing myself and what will I need? A) Steel fencing can be installed by the client or through a contractor depending on the client’s level of knowledge. Our advice is best leave it to the professionals if you’re not qualified and don’t have the experience needed. If you do however want to go ahead with erecting steel fencing yourself make sure at all times to follow safety procedures and use the correct tools appropriately. The tools and supplies you made need include shovels, cement, sledgehammer, hard hats, high visibility wear and any other safety gear as recommended for using certain tools.